Dark knuckles (finger joints) are usually caused due to over-production of skin melanin( A natural pigment that gives skin dark color and protects against harmful effects of UV sun rays). Besides over-production of skin melanin, lack of skin moisture, skin dryness, excessive rubbing or friction against skin and low level of blood hemoglobin are some other causes behind darkening of finger joints. Dark knuckles looks quite unpleasant especially when a person’s natural complexion is fair then these dark knuckles become more prominent and decrease the overall beauty of hands. 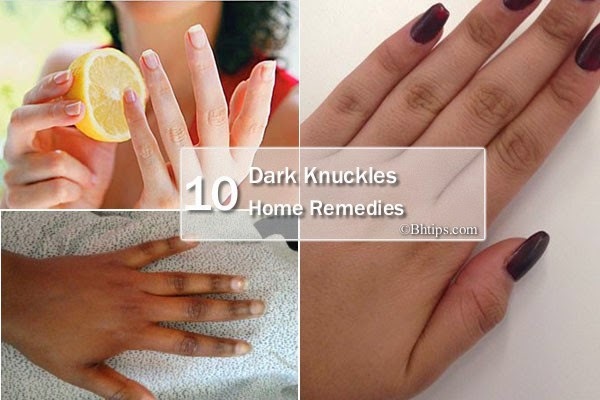 However, In this article, we are going to share some best home remedies that will definitely help to lighten the complexion of your dark knuckles. To get rid of dark finger joints you can prepare a natural but very effective scrub even at home simply by mixing 3-4 coarsely ground almonds and 1 tablespoon of milk cream. Apply this scrub on your dark knuckles and pay special attention on dark areas. Gently massage for 3-5 minutes and then wash off after 20 minutes. Skin fairness properties of almonds and skin moisturizing properties of milk cream, both are highly beneficial in getting rid of dark knuckles. For best results repeat this at least twice a week. Almonds and yogurt paste is also very helpful in removing darkness from your finger joints. To prepare this paste you need about 1 teaspoon of almond powder and mix with 2 tablespoons of yogurt. Before applying this paste, clean your dark knuckles and then apply this paste and massage for few minutes. Leave for half an hour and then wash off. Take 1/4 teaspoon of almond oil, 1 teaspoon of milk cream and 1/2 teaspoon of turmeric powder. Mix them well and apply on your dark finger joints. Massage for few minutes and wash your fingers after 20-30 minutes. An other effective way to remove darkness from knuckles is by soaking a bread slice in some milk and scrub your finger joints with this milk soaked bread slice. Continuously scrub for 5-10 minutes and then rinse off. For best results, repeat this on a daily basis until you get the desired results. A mixture of Buttermilk and Lemon juice is also very helpful to lighten your dark knuckles. Take 2 tablespoons of buttermilk and mix with 1 teaspoon of lemon juice then apply on dark finger joints. Massage for few minutes and then leave for 15-20 minutes. Finally wash off with warm water, pat dry your skin and apply a good moisturizer to prevent skin dryness. To get rid of dark knuckles take some milk cream and massage your dark joints with this cream. Leave this on for about 20 minutes and then take a fresh slice of lemon and rub this on your finger joints for few minutes. Finally wash your fingers with cold water and apply a good moisturizer. For best results you can repeat the same procedure on a daily basis. To lighten your dark finger joints you can make a paste by mixing equal amounts of honey and lemon juice. Apply this mixture on your dark joints and massage for few minutes. Leave at for half an hour and then wash off using normal water. Extract the juice from one lemon but don't discard the lemon halves after you have extracted the juice from it. Now mix this juice with 1 teaspoon of glycerine and 1 tablespoon of sugar. Now combine these ingredients and soak one of the lemon halves in this solution and gently scrub it on the dark finger joints. Use the other half of the lemon to scrub the other hand. Let this solution stay on your dark knuckles for 15-20 minutes. Finally wash off with fresh water. Repeat this procedure at least thrice per week. A combination of aloe vera gel and almond oil is very beneficial in getting rid of dark knuckles. Blend 1 teaspoon of aloe vera gel with 1/2 teaspoon of almond oil and apply it to your dark knuckles and leave it on overnight. Next day wash this mixture with fresh water. For best results repeat this on a daily basis. A scrub made from olive oil and sugar is also very beneficial in getting rid of dark knuckles. Take 1 tablespoon of olive oil and 1 teaspoon of sugar. Mix them and use this scrub to rub the dark knuckles of your fingers. Gently rub this on your knuckles for few minutes and then leave for about 15 minutes. Finally wash off with fresh water and apply a good moisturize.